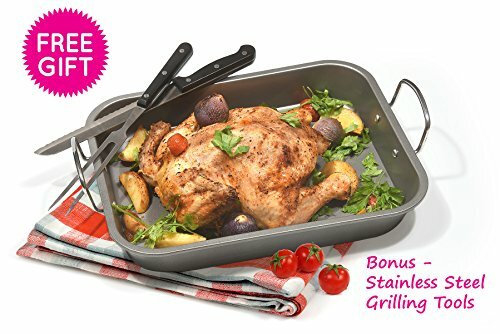 Whether you're a seasoned chef, a cooking student or simply someone who cares about the virtues of delicious food, put this roasting pan and utensil set bundle in your cart now to add a significant yet affordable item to your collection of quality kitchen cooking tools. Best results come when you use the right cookware for the job. 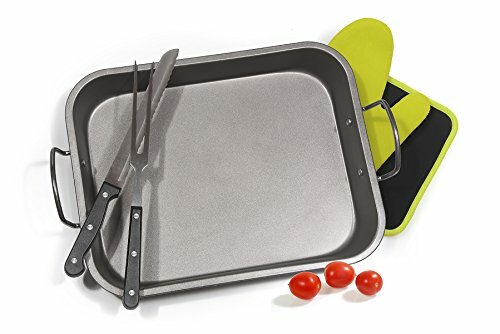 The carbon steel roasting pan in this set is high-quality with qualities similar to cast iron, but comfortably lighter weight. The more you use the pan and "season" it with added oils for cooking as well as food's natural oils, the better it gets! That's why this pan will last you a lifetime. A seasoned carbon steel pan will also yield great non-stick properties. Another great feature is the pan's super ability of retaining heat, so that once it gets hot, it stays hot (can stand oven heat of 500°F/260°C). 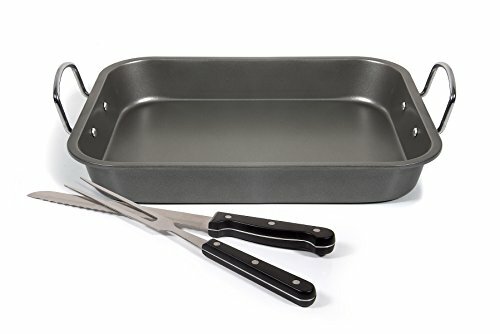 And it's a pretty big pan - measuring 16-1/2" (42 cm) x 11-4/5" (30 cm) x 2" (5.5 cm). This is a good place to mention that you must wear gloves when grabbing the pan out of the oven by the handles. 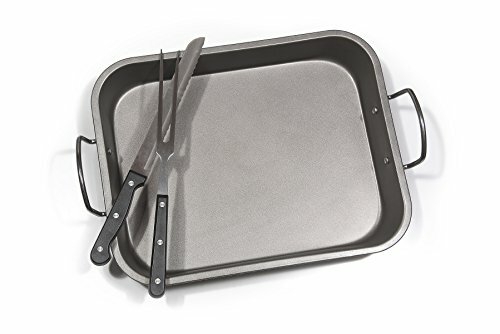 Your pan comes with a wonderful serrated knife and meat fork. Each measure approximately 12-3/5"( 32 cm). 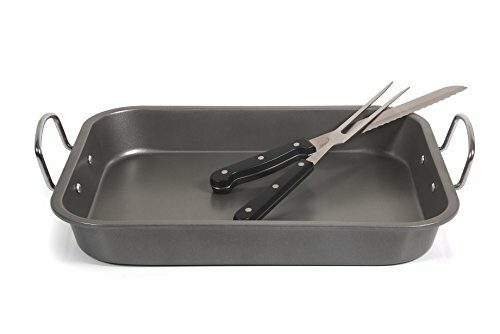 FOX Home's roasting pan with knife and meat fork is the perfect gift for yourself or someone you care about. See the pretty way it's wrapped in the photos. IMPORTANT NOTE: Hebrew text that you see on the package are instructions for use. We will send an English-language set of instructions to you by e-mail. A TASTEFUL GIFT! - this holiday season share the gift of comfortable cooking with your favorite foodie, home cook, avid entertainer, culinary school grad or family member who has great taste in the kitchen! If you have any questions about this product by FOX HOME, contact us by completing and submitting the form below. If you are looking for a specif part number, please include it with your message.